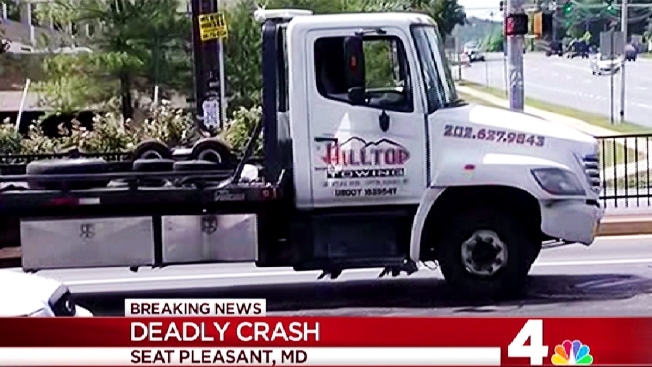 A man in a station wagon in Seat Pleasant apparent suffered a medical emergency before crashing into a tow truck and collapsing late Tuesday morning. Now Prince George's County police are calling this a fatal accident, reported Prince George's Bureau Chief Tracee Wilkins. According to a witness, someone -- believed to be the driver -- in the older-model station wagon appeared to be having a medical emergency when the car crossed the median of Central Avenue and hit a tow truck. Immediately after impact, another person jumped out of the station wagon's passenger seat saying the man was having a heart attack, said the owner of the towing company. The man collapsed outside the station wagon, and several people on the scene attempted to resuscitate him. He was taken into an ambulance and brought to a hospital. The tow truck driver and his young son, who was in the truck with him at the time, were also taken to the hospital and are recovering, said the towing company owner. Central Avenue remains shut down at the scene of the crash.